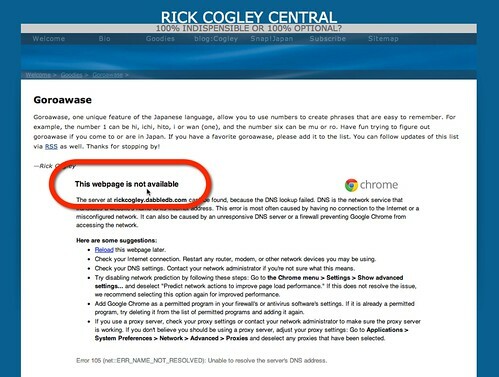 I had a bit of a journey in relaunching Rick Cogley Central, this time creating it in a static site generator over my previous tool RapidWeaver. Read on to hear the gory gory! I’d watched the second version of this site deteriorate over a couple of years, cobwebs proliferating and junk piling up in the corners, so it was really time for a bit of a “spring cleaning”. I decided to take steps to deploy a static or “baked” style of website this time, over anything dynamic, such as a server-hosted CMS. Static site generators generally involve you writing site content as text files in your local drive in a format such as textile or markdown, where you use simple markup to simulate things like bold or italics by surrounding the words thusly: *bold* and _italics_. Then, you use a terminal command to generate the site locally while merging in the stuff that appears on every page, such as sidebars and menus and footers. Once you generate, you next deploy the site to your server, via various means, such as rsync, ftp or a git push. You really need to be a bit of a hacker to use a static site generator, but I’m a manager these days. Luckily Octopress was complete and polished enough that I could bone up on the related technologies at my own pace. An ulterior motive was that I wanted to learn how to use git, as all the cool kids are using it. The workflow of writing a post or page in markdown, adding it to my local git repository, committing it, pushing it, and deploying it to the site, has now become second nature. Since we use them for some other reasons, I am hosting and deploying my git repository using Atech Media’s CodebaseHQ and DeployHQ services, and the site hosting proper is being done over at the rock-solid Webfaction. I hired Paul Serous, a web developer from Ukraine, to coach me in not only the git basics and the other technologies I need to know, but also to do the heavy ruby programming that I have no time or need to learn. Paul did an exemplary job not only on those things, but really went the extra mile to adapt and apply a responsive HTML5 and CSS3 theme based on the famous and somewhat ubiquitous Twitter Bootstrap, to the site. Thank you Paul; I really appreciate your quality work, help and patience. As you poke around, you might spy some Semantic HTML, while I’m using some now-well-accepted Microdata such as the Person schema, and Microformats such as hCard, with rel-tag sprinkled in around the site to keep Google’s “rich snippets” checker happy. As I did this work, I felt more and more that we truly stand on the shoulders of giants, who did so much work in the past that we benefit from today. Thank you one and all! Join the discussion at my Google+ post. Welcome to Rick Cogley Central - with blog articles, photos and other resources. I'm an experienced IT consultant and project manager, and have been based in Japan since 1987. I run a company called eSolia Inc., and we provide IT management services to multinationals for their Japan operations and projects.